Kayaking is very much an individual sport. By that I mean that the richness of the experience allows each person to create their own type of meaning and purpose. The myriad of reasons why people enjoy kayaking are as varied as our personalities and change throughout our lives. Many people enjoy the outdoor exercise, while others value a Class 5 adrenaline experience or the social interaction on a trip, and on and on. Despite what I’ve thought in the past (and perhaps been too quick to express to anyone that would listen on long trips to the river), I’ve recently come to accept that I don’t have a monopoly on the most virtuous motivations for kayaking and I’ve tried to adopt a more “live and let live”, less judgmental philosophy. Whatever floats your boat, kind of thing. I’ve also been thinking more about why I kayak and what kind of kayaking experience I value most. I was fortunate when I started kayaking to connect with several mentors that really enjoyed doing a wide variety of different rivers and the experience of seeing new places still resonates the most with me. While I think it is easy to get caught up in the search for “first descents”, for me, it’s become more about the search for new places to explore and experience. If there was a guidebook that covered every boatable stretch of river in Oregon, I’d still want to get out and experience as many of those places as possible although I’d probably be able to save myself from getting stuck out on some miserable runs. Kayakers seem to have a penchant for keeping lists. A list for the rivers I’ve run and another list of the rivers I want to run are the two most common for most, but being the somewhat obsessive person I am, I’ve developed lots of different variations. When someone asks me “What’s on your list for this year?”, I have to follow up with “Which list? Runs that need early fall rains because snow blocks access? Or runs that can only be done during hunting season? Or exploratory runs that I hope will be good? Or exploratory runs that I expect will be horrible?” Well, you get the idea. The Oregon Coast Range Mountains are a uniquely beautiful and fascinating place but not exactly on the cutting edge of exploratory kayaking due to lousy geology and a lack of consistent gradient. There are some great intermediate runs sprinkled about but once the gradient increases, so does the trashy rapids and wood. In fact, probably 80% of the rivers I’ve looked at in the coast range fall into the category of “are we going to get off this river with our bodies and gear intact” rather than anything classic that I’d come back to year after year. Drift Cr., and Upper Devil’s Lake Fork are two great examples of typical kayak exploring in the coast. 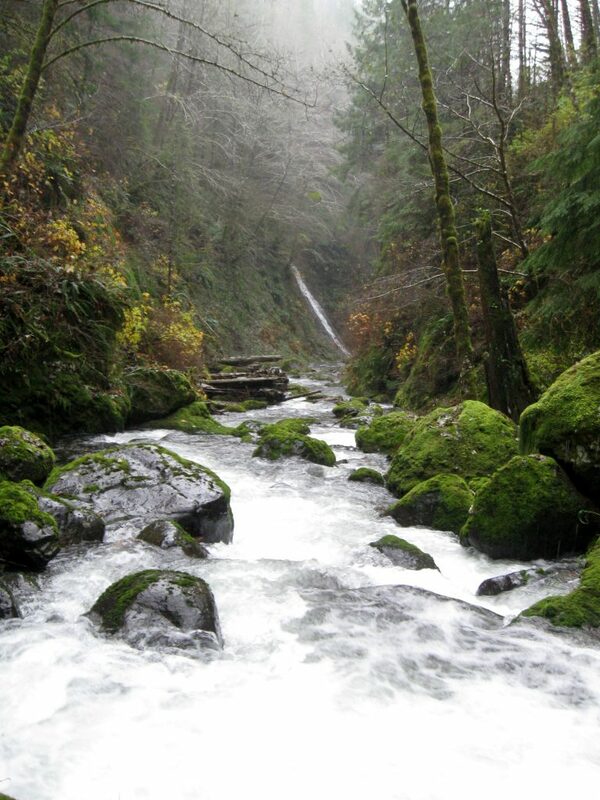 So, getting back to the Little North Fork of the Wilson (what this is supposed to be about after all), the LNF flows through a tantalizing 11 miles of blank map space in a mountain range that is otherwise over-crowded with a maze of logging roads. Similar to the Salmonberry River just to the south, the Little North Fork looked like it might present a uniquely remote kayaking experience in the coast range. Not to say that it was guaranteed to be enjoyable. Satellite photos show plenty of logging in the area and the last 6 miles looked essentially flat on the topo map. But, there is always hope for some of us, so I started a bit of easy reconnoitering (driving to the put-in after boating Jordan Cr., checking out the take-out on another trip). Looking at the small braided stream at the put-in didn’t really inspire me to explore further downstream so it sat on the Back Burner List for awhile. Finally the time seemed right so I convinced Jacob Cruser (Hey Jacob, there’s a couple miles of 200fpm gradient!) to head out there one day when the flows seemed good. Planning on 11 miles of unknown river is a bit daunting, particularly in the winter when there is only 9 hours of daylight and exploratory kayaking trips can easily take over an hour per mile if things go bad. I was counting on the last few miles of flat river to help us reach the take-out before dark. We got a very early start from Portland until we hit snow coming over the pass and I started to wonder if we could even get to the put-in. True to form, I couldn’t get my car up the steep hill to the put-in even with chains so we aborted the trip. After getting turned away, the LNF Wilson moved from the “Back Burner List” to the “I’m going to get on this river come hell or high water List”. Fast forward to this year with some nice early season rain with high snow levels and it seemed like a good time to give it a shot. Jacob was up early in prep for another exploratory trip but when that fell through, the LNF Wilson seemed like a decent alternative. This time, our hopes rose a bit when there was no snow on the pass or on the way to the put-in, but, looking at the river at our planned put-in, we saw there was barely any water in the river. Oh well I thought, that sometimes helps if it all goes to hell as you can just walk down the stream (my expectations were still pretty low). The first bit was shallow and a bit loggy but as the walls started to close in a bit and I got out to scout, I found a nice little ledge drop with no wood! Our hopes rose a bit more with a couple more drops before we got to a large horizon line that we got out to scout. This one might go with more water but as it was, we portaged. The next rapid drops 30’ through a nasty looking boulder pile. This is a little more what I expected as we slogged up the hill through brush and tried to get back down to the runnable bottom section of the rapid. We took 30 minutes to essentially make 20’ of downstream progress and I think each of us fell in at least one hole. There was so much debris on the ground that it was tough to tell whether you are walking on solid ground or just a jumble of boulders with gaps to fall into in between. For future reference, we should’ve stayed at river level and I hoped there aren’t too many more of those portages. Once we got back down to the river, the bottom section actually looked very runnable although it was tight. 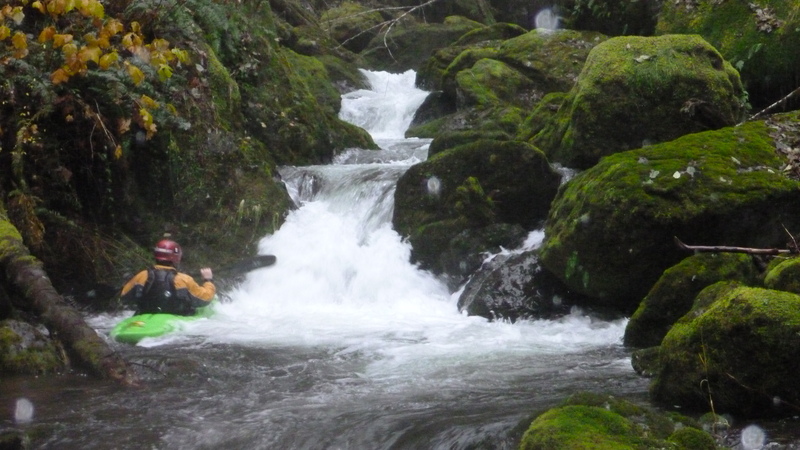 Jacob has never shied away from shallow, steep, narrow rapids so he proceeded to fire it up while Andrew and I put-in just downstream and ran the last drop. Jacob of course came through with no problems. So far the river had been pretty much what I expected but progress was pretty slow and I knew there would be at least a couple more rapids in the upper steep section to contend with. 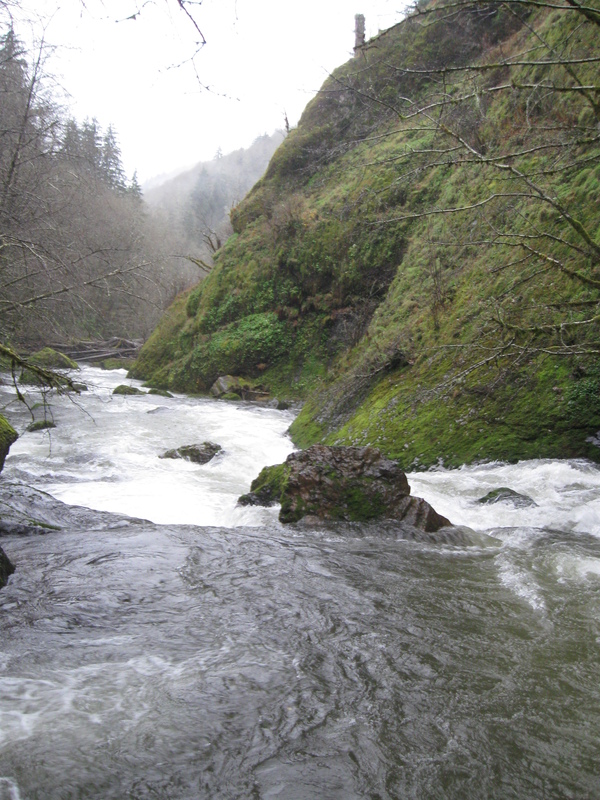 Not too much further downstream was another horrible looking boulder cascade that looked almost runnable (more water?) but in the end, all of us valued our boats and bodies too much to risk the damage. Again, as with the previous boulder cascade, the last drop of the cascade was runnable so Andrew and Jacob fired that up. At this point, although I didn’t say anything to the others for fear of jinxing us, I was pretty optimistic that we were going to make it out before dark. I know that’s not much of a standard but it’s pretty high on my priority list so I tend to focus more on that than some others. 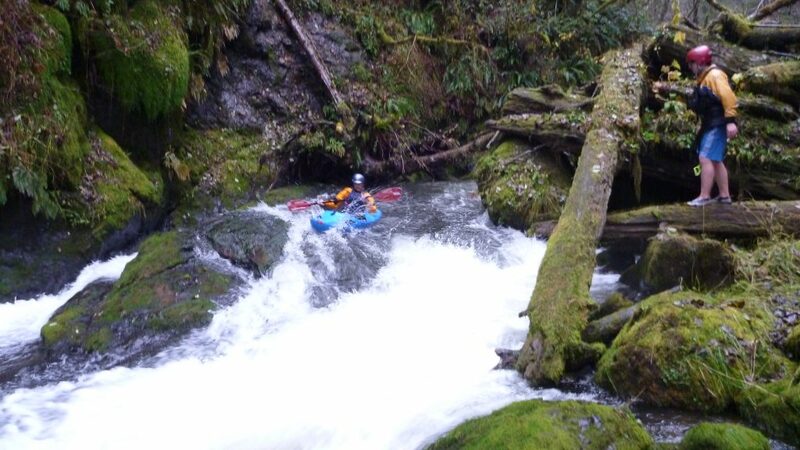 There hadn’t been any rapids blocked by wood and the sections in between the steep stuff was pretty good, small ledges and flats with a few easy wood issues. I figured that once we hit the flats, we could walk most of the river if necessary and still make good time. Below the boulder cascade the gradient started to ease off a bit and there were more flat sections separated with some fun small ledges and slides. We still had pretty low water but with a few small tribs coming in occasionally, the boating was more and more reasonable with a few portages here and there. Most of the portages were pretty straightforward although there was one rather large logjam that made for an interesting climb back to the river. Below the big logjam I was startled when it seemed like one of the rocks jumped up and swam away under my boat. In the next eddy I realized it wasn’t a rock but rather a huge King Salmon! And then I saw several others in the river. With the low water, there wasn’t anywhere for the salmon to hide so we chased each other down the river. These fish were huge and there were lots of them! We continued to make good time down the river and the scenery was excellent throughout. Waterfalls coming down the canyon walls, nice small rock walls every now and then, and some pleasant rapids. We eventually got to the point where the river got quite a bit wider and was pretty flat so I assumed we were in the runout and would have an uneventful rest of the trip. Thankfully I was wrong. It turned out that the flat “runout” actually had several really fun, classy Class IV rapids spaced at even intervals. We happily bopped down rapid after rapid with big grins all around. After scrapping down most of the upper section of the river, the rapids in the lower were nicely padded with fun waves and holes. The rapids in this section had a nice variety of moves with several boulder gardens, slides, small ledges and a couple holes to punch. After each rapid we looked at each other and said “Well that’s probably the last rapid.” and then around the corner the river would drop through another fun rapid. It was a truly remarkable surprise. We eventually got to the true last rapid and had a pleasant float down to the confluence of the Wilson and the take-out. The NF Wilson is just north of the Wilson River and parallels the Wilson heading west. 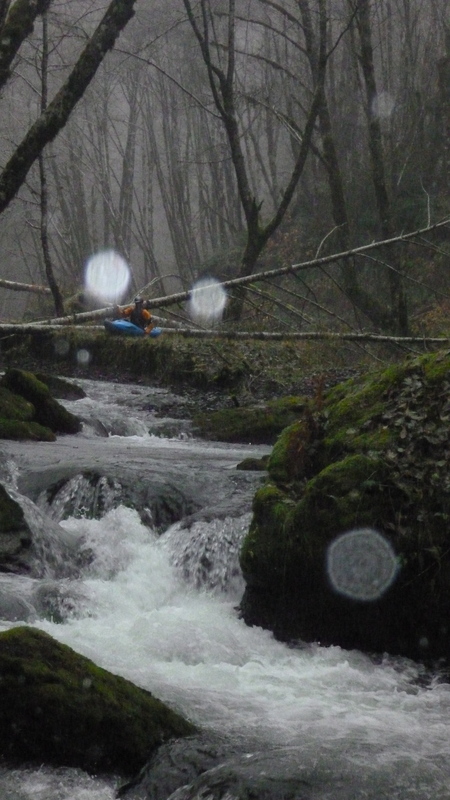 We put-in at the confluence of several tiny tribs in the Cedar Butte area north of Jordan Creek. 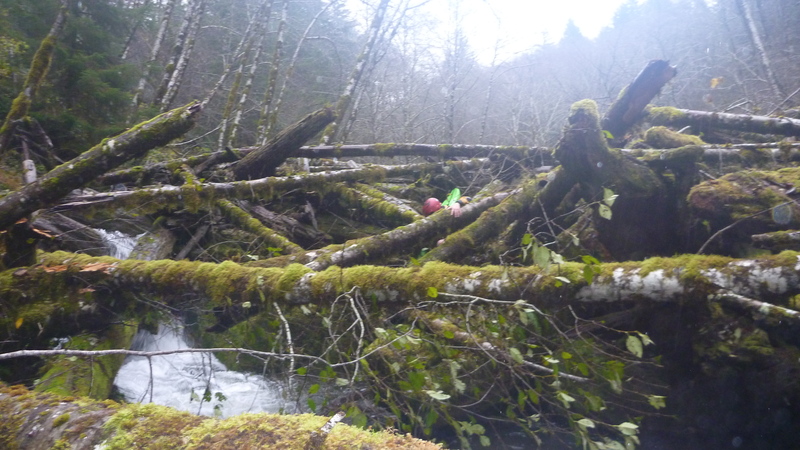 We took out at the confluence of the NF Wilson and the Wilson River which is about MP6 on the Wilson River Highway. There is good road access all the way to the put-in although the road is very steep in places so be prepared if there happens to be snow. We had approximately 2500cfs on the Wilson River gauge without rain for a day and with the gauge holding fairly steady. There was light rain throughout the day. Jordan Cr. was low but runnable as judged from the take-out bridge. I’d say 50% more water would be a fun level although some of the log limbos would be portages. Some of the portages might be runnable though. Overall, the fun/work ratio was much higher than I expected mainly due to the really nice rapids towards the end of the run. The scenery was outstanding and all I was hoping for with several sections of fantastic, Coast Range, old-growth forest, elk, bald eagles, and tons of salmon. This was probably one of the more magical rivers I’ve kayaked. With how junky the top section of river is, I doubt this will ever be a classic river for kayaking but with more water, who knows. As it is after our first trip, I’ll definitely be back to explore this river again.